[Kevin] owns a benchtop CNC mill that has proven itself to be a capable tool, but after becoming familiar with some of its shortcomings, he has made a few modifications. In order to more efficiently hold and access workpieces on his custom fixturing table, he designed and made his own toe clamps and they look beautiful. The usual way to secure a piece of stock to a fixturing table is to use top-down clamps, which hold the workpiece from the top and screw down into the table. However, this method limits how much of the stock can be accessed by the cutting tool, because the clamps are in the way. The most common way around this is to mount a vise to the table and clamp the workpiece in that. This leaves the top surface completely accessible. Unfortunately, [Kevin]’s benchtop Roland MDX-450 has a limited work area and he simply couldn’t spare the room. His solution was toe clamps, which screw down to the table and have little tabs that move inwards and downward. The tabs do the work of clamping and securing a piece of stock while maintaining a very low profile themselves. The clamp bases are machined from stainless steel and the heads are brass, and the interface between the two is a set screw. Inserting a hex wrench and turning the screw moves the head forward or back, allowing a workpiece to be clamped from the sides with minimal interference. His design was done in Fusion 360 and is shared online. Another option for when simple clamps won’t do the job is a trick from [NYC CNC], which is to use an unexpected harmony of blue painter’s tape and superglue which yields great results in the right circumstances. This build began by simply cutting a wooden block, packing it in sand, and melting approximately 1425 shell casings of various calibers in a DIY furnace. The molten brass was then simply poured into the open mold. 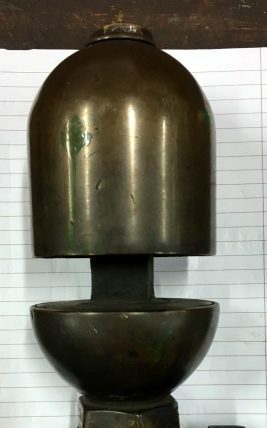 This is standard yellow brass, with about 70% copper and 30% zinc. There’s a bit of aluminum in there from the primers, and the resulting block isn’t terribly great for machining. [John] says this could be fixed by adding a few percent of lead to the melt. To all the jokesters suggesting he add some unfired bullets to the melt, don’t worry, we already have that covered. chiseling a hole square, with a chisel. 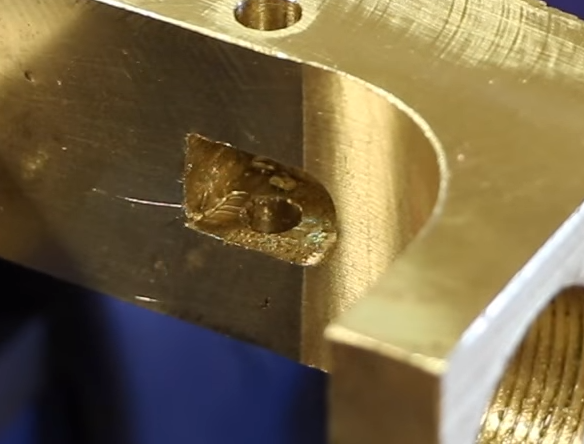 The machining went as you would expect it would with a large mill, but there are a few things that made this entire video worthwhile. For some of the holes, [John] had to square up the corners. The simplest and easiest way to do this is to break out a file. This is brass, though, and with some steel chisels hanging around the shop your mortise and tenon skills might come in handy. With the very careful application of force, [John] managed to put corners on a circle with a standard wood chisel. A bit later in the build video, a few more sharp corners were created by shoving a broach in the mill and jamming it down into the work. When it comes to machining builds, this is high art. Yes, it’s the same as building an AR-15 out of a few hundred soda cans, but this one is made out of brass. It looks just great, and that final polish turns the entire project into something that looks like it’s out of a video game. Simply amazing. If you’re looking for more ways to push your metalwork boundaries, give cast iron a try! Before the invention of the high-powered LED, and even really before the widespread adoption of electric lights in general, lighthouses still had the obligation of warning ships of dangers while guiding them into various safe harbors. They did this with gas lights and impressive glass lenses known as Fresnel lenses which helped point all available light in the correct direction while reducing weight and material that would otherwise be used in a conventional lens. Now, a company in Florida is using acrylic in reproductions of antique Fresnel lenses. At first glance, it seems like acrylic might not be the best substitute for glass, but the company is able to achieve extreme precision using a CNC machine and then polishing and baking the acrylic which makes it transparent and excellent for use in lighthouse lenses like this. The reproduction lenses are built out of brass, and the lens elements are glued in place with a special adhesive. It’s a convincing replication worthy of use in any lighthouse. Be sure to check out the video below to see how these lenses are built, and although we’re not entirely sure what exactly is being sprayed on the lenses when they are being polished, perhaps someone in the comments section can illuminate that for us. Of course, there are other uses for Fresnel lenses than in lighthouses, and we’ve seen some great examples of them put to use for many different applications.